A city, during the Ptolemaic period, in Lower Egypt on the Damietta arm of the Nile near the present Benḥa (Benḥa al-Asi), south-west of Zagazeeg. On the hill near Benḥa there are vestiges of the old city of Athribis. A Jewish colony must have dwelt here, as is proven by two Greek inscriptions which were discovered on the hill in 1876. The first reads, "In honor of King Ptolemy and of Queen Cleopatra, Ptolemy, son of Epicydus, chief of the guards, together with the Jews resident in Athribis [consecrate] this place of prayer to God the Most High." The second inscription reads, "In honor of King Ptolemy and of Queen Cleopatra and of their children, Hermias and his wife Philotera and their children [consecrate] this exedra and this place of prayer." It seems probable that all the persons mentioned here were Jews. The expression "God the Most High" is the equivalent of the Hebrew "El 'Elyon" (compare Eusebius, "Præp.Evan." i.10, Ἐλιουν ὁ ὑψιστος). 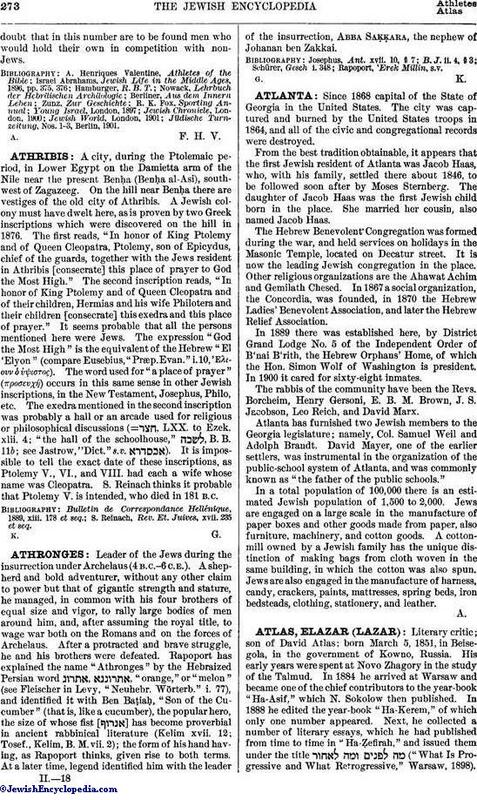 The word used for "a place of prayer" (προσευχή) occurs in this same sense in other Jewish inscriptions, in the New Testament, Josephus, Philo, etc. The exedra mentioned in the second inscription was probably a hall or an arcade used for religious or philosophical discussions (= , LXX. to Ezek. xlii. 4; "the hall of the schoolhouse," , B. B. 11b; see Jastrow, "Dict." s.v. ). It is impossible to tell the exact date of these inscriptions, as Ptolemy V., VI., and VIII. had each a wife whose name was Cleopatra. S. Reinach thinks it probable that Ptolemy V. is intended, who died in 181 B.C. S. Reinach, Rev. Et. Juives, xvii. 235 et seq.